Here you will find all you need to know to find cheap PS4 games online. From brand new and pre-orders to bundles and pre-owned, we have everything covered. Who doesn't love a bargain? Playing games can be a really expensive hobby so if you're looking for cheap PS4 games from UK, whether it be brand new, used, in bundles or even cheap ps4 games codes, we are filled with great deals, and is perfect for those who don't like spending too much! 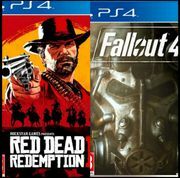 Our community of bargain hunters are always on the lookout to find the best possible deals around and we've rounded up essential information you need to know on where and how to find cheap PS4 games online. If you're new to gaming and is looking for a cheap PS4 console, lookout for bundle offers. These are either customisable or ready-made offers of consoles, games and accessories that are cheaper when buying them separately. PS4 games are more expensive when launched during their first few week or months in the market, so if you want to save on that new game you've been wanting to get your hands on, pre-order it. Amazon is a great place to check out cheap PS4 games before their release. If you have patience, you can hold out for a while and wait for the prices to drop. Games can be really expensive on release but it prices can significantly fall very fast even for popular titles like Call of Duty and FIFA. 365Games stock an incredible range of PS4 games including special offers such as price drops even on big titles. Trade in your old unwanted games in Game or CEX and they will offer you cash for them, but more like in-store credits to purchase other products from them. Rent online. Our members love Boomerang, you can rent or buy cheap PS4 games online from only £3.99 per month PLUS it comes with a 21 day free trial. Where can I get the best deals on PS4 games online? Game also came up with new deals on their Christmas Sale where you can get discounts for up to 50% off on select PS4 games like Assassins Creed Origins, Star Wars: Battlefront II, Destiniy 2, their cheap PS4 games on sale starts at just £17.99! There's also a small reduction on Call of Duty WW2, which is down to £44.99. If you're unsure on whether to buy a digital copy of your favourite titles or a physical disc, here are some things to help you decide which one will work best for you. One of the pros from purchasing digital downloads is that you get access to latest releases right away as well as to all your library without having to swap discs, all you have to do is use remote play. In addition, you can take advantage or the PlayStation store sales and discounts which are really good most of the time. On the other hand you can trade or sell physical disc when you're bored with them or have finished the entire game. You can also use it on other PS4's without the need to sign in to your PSN account. Now for the cons. You can't sell digital copies nor can you download them when the PSN network is down. There's also the risk of losing all your purchases if your account gets hacked or banned and if you delete the installation, you need to re-download everything. Another important setback is that it uses a lot of bandwith. With physical discs, one of the biggest cons is the possibility of scratching the disc if you're not careful with it as well as misplacing or losing it. You are also restricted to the game you are currently playing and you can't remotely swap discs, you have to swap discs in order to play a new game.